When BusinessWest launched the Difference Makers program in 2009 (see past winners HERE), it was with the understanding that there were several components to this initiative. The first is what this special edition has become, a comprehensive effort to shine a light on individuals, agencies, and institutions that are finding profound and often unique ways to improve the quality of life in the community we call Western Mass. These light-shining efforts are profiled with words and pictures that collectively tell some very poignant stories. The second component of this program, the more fun one, is the event at which the honorees are recognized for their various accomplishments and contributions. Since the beginning, those of us at BusinessWest have struggled with what exactly to call this gathering. ‘Dinner’ doesn’t quite work, because, although the food at the Log Cabin is certainly excellent, the evening’s festivities encompass so much more. ‘Gala’ falls short, too, because this connotes black ties and formality, and there is little of that at this event. • We start with a nod to the region’s community colleges. While perhaps not as famous as the region’s many fine private schools or UMass Amherst and other four-year institutions in the state system, these schools — Berkshire Community College, Greenfield Community College, Holyoke Community College, and Springfield Technical Community College — are playing an absolutely critical role in the development of this region. They act as both a door of opportunity, especially to those who don’t have many available to them, and a pathway to careers, through both degree and certificate programs that provide job skills and also transfer opportunities to four-year schools. Meanwhile, behind almost every major economic-development initiative in this region, there is a community college playing a significant role. 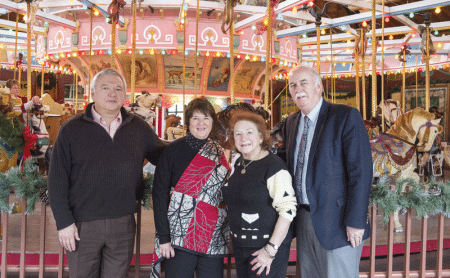 Some of the many passionate Friends of the Holyoke Merry-Go-Round: from left, Jim Jackowski, Barbara Griffin, Angela Wright, and Joe McGiverin. • We continue with the Friends of Holyoke Merry-Go-Round Inc. The story of how this group raised the money to save the carousel at Mountain Park and keep it in the Paper City has been told many times. But there’s a reason for it. This is an epic tale of a community coming together and battling long odds to save a treasure that could very easily have become someone else’s treasure. But buying the carousel was just the first chapter in the story, really. Keeping it operating amid a host of stiff challenges so that it may be enjoyed by more generations of ‘young’ people (with young in quotation marks for a reason) is an ongoing saga and one certainly worth celebrating. • As are the contributions of Denis Gagnon Sr. 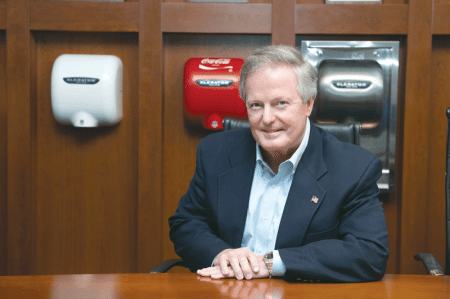 He has improved our lives by dramatically reducing the amount of time we need to spend in the restroom drying our hands with his company’s XLERATOR. But that’s not why he’s being honored. OK, that’s part of it. The other, much bigger part is how he has devoted generous amounts of time, energy, and imagination to groups and causes ranging from the Boy Scouts to the Children’s Study Home to a host of veterans’ initiatives, and, while doing so, serving as a true inspiration to others. Jennifer Connolly stands beside the portrait of JA co-founder Horace Moses at the agency’s offices in Tower Square. • Also worth celebrating are the contributions of Junior Achievement of Western Mass. This is a group that has been around a long time now (its centennial is coming up in 2018), and it would be easy to take its many programs for granted. That would be a big mistake. 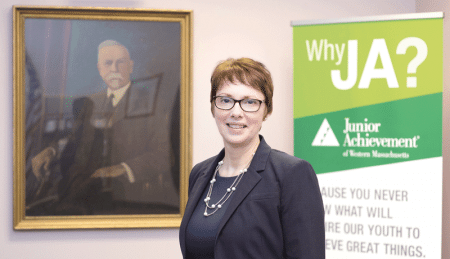 As the story reveals, JA programs run much deeper than showing high-school students how to make and sell lamps (although that’s where it all started, and that solid foundation remains). The organization begins by teaching vital lessons in financial literacy to kindergarten students, and stays with these young people until they’re ready for college or whatever other path they choose. And because JA stayed with them, the lessons stay with them as well. • Last but certainly not least, there is Joan Kagan, whose career and accomplishments are worth celebrating for many reasons. 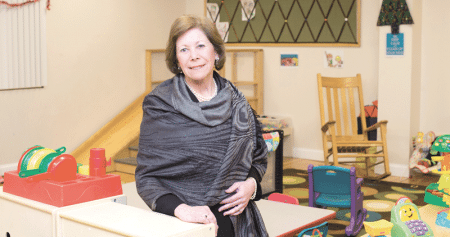 She has steered the organization known as Square One (formerly Springfield Day Nursery) through treacherous whitewater in the form of seemingly endless adversity. It has come in waves, literally and figuratively, from a tornado to a natural-gas blast to persistent fiscal challenges. But her more lasting contribution has been tireless efforts to not only serve children and families, but lobby state and federal leaders for the many kinds of support they need and deserve. COST: Tickets are $65 per person, with tables of 10 available. To order, call (413) 781-8600, ext. 100. For More Information: Call (413) 781-8600, ext. 100, or go HERE.